Praise for the previous edition: "This work has great visual appeal and superb images...a superior text that will undoubtedly withstand the test of time." --Gastroenterology Written and edited by internationally renowned specialists, the second edition of Gastroenterological Endoscopy covers the entire spectrum of diagnostic and therapeutic procedures for the upper and lower GI tract and provides an up-to-date overview of GI disorders. The book opens with a section on the development and technology of endoscopy, followed by an expanded section on issues related to patient care, such as informed consent, sedation, and special clinical conditions. The discussion of techniques for the diagnosis of GI diseases ranges from enteroscopy and colonoscopy to recent advances in capsule endoscopy and chromoendoscopy. New to the section on therapeutic procedures is coverage of such topics as dilation techniques, resection, ablation, and dissection. The book closes with a chapter on pediatric endoscopy. 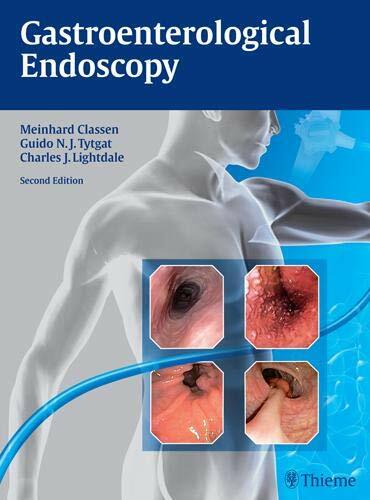 Features of the second edition: Thirteen new chapters present current developments in the specialty, including evidence-based approaches, natural orifice translumenal endoscopic surgery (NOTES) and hybrid procedures, endoscopic therapy in obesity, and therapeutic endosonography Insightful contributions are presented in a format that aids rapid reference to key topics 1,820 high-quality illustrations and endoscopic images, including over 1,135 in full-color, demonstrate anatomy and pathophysiology Already a standard in the field, this text is an essential desk reference for all clinicians in gastroenterology, internal medicine, and GI surgery. Residents and fellows in these specialties will also greatly appreciate its easily accessible wealth of information and visual appeal. Gastroenterological endoscopy has experienced tremendous advances in recent years. In this outstanding new edition of a highly successful standard, you'll get state-of-the-art information on all therapeutic developments and innovations in the field. Acclaimed gastroenterology specialists from around the world have come together under the editorial leadership of Meinhard Classen, Guido N.J. Tytgat, and Charles J. Lightdale to create this pace-setting reference work. From basic examination techniques to the latest treatment strategies in gastroenterology, you'll learn how to recognize diseases and reach an accurate diagnosis for disorders of the GI tract. Approx. 1,500 illustrations, most in full-color, cover the full spectrum of pathophysiology. Topics covered include: hemostatic and coagulation procedures; the use of lasers; polypectomy and mucosal resection; sphincterotomy; biliopancreatic tract stenting; and much more! The most up-to-date manifestations of diseases, including the appearances of the opportunistic GI infections in AIDS, are illustrated in spectacular detail. Special features of this groundbreaking text: This title features approximately 1500 high-quality, color illustrations, over two per page! It offers easy navigation through the book, with sections organized by procedures and by disease. It is written and edited by worldwide specialists of the highest caliber. It provides vital information on the latest developments for providing optimal patient care. For all gastroenterologists and GI surgeons, this text is an essential reference. Residents and students will also benefit highly from it. Your library is not complete without this valuable book, already the standard-bearer in the field.